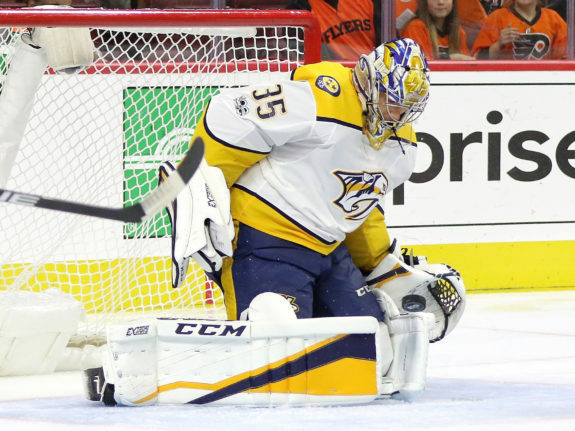 Can the Nashville Predators Avoid the Presidents' Trophy Curse? Can Predators Avoid Presidents’ Trophy Curse? The Stanley Cup playoffs are upon us once again, and, as the No. 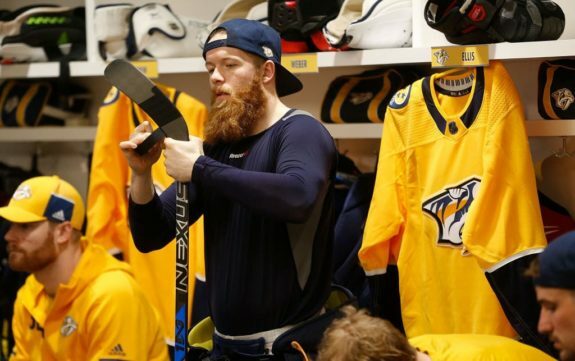 1 team in the league, the Nashville Predators have been getting the lion’s share of the attention during the lead-up to their first game of the postseason against the Colorado Avalanche on Thursday. They opened up as the betting favorites in Vegas, and it’s easy to understand why – led by outstanding goaltending from Pekka Rinne and Juuse Saros along with potentially the league’s best blue line, consisting of P.K. Subban, Ryan Ellis, Roman Josi, and Mattias Ekholm, the Preds finished with a record of 53-18-11 in the regular season, which earned the franchise their first-ever Presidents’ Trophy. The four defensemen, in particular, are arguably Nashville’s biggest advantage over the rest of the league – all four averaged more than 23 minutes of time on ice per game, and all four posted at least 32 points on the season. Ellis was the only one not to reach the double digits in goals, but he missed nearly half the year and still lit the lamp nine times. Not too shabby if you ask me. Combine that with a lethal top forward trio of Filip Forsberg, Viktor Arvidsson, and Ryan Johansen, and you have a team that easily could blow past the competition en route to a second consecutive berth in the Stanley Cup Final. 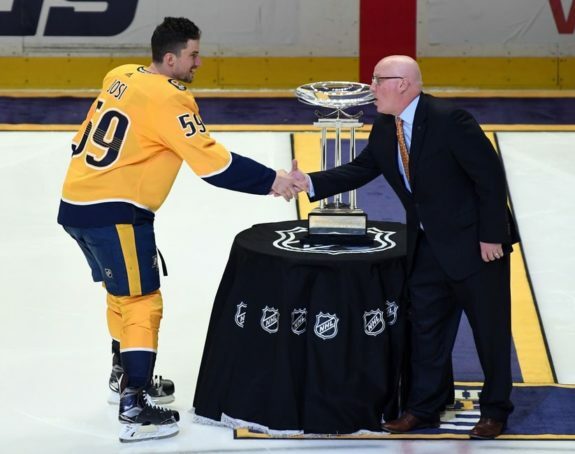 However, despite all of their regular season success, could the Predators become the latest team to fall victim to the infamous Presidents’ Trophy curse? Historically, Presidents’ Trophy winners haven’t had much luck when it comes to winning the Stanley Cup. 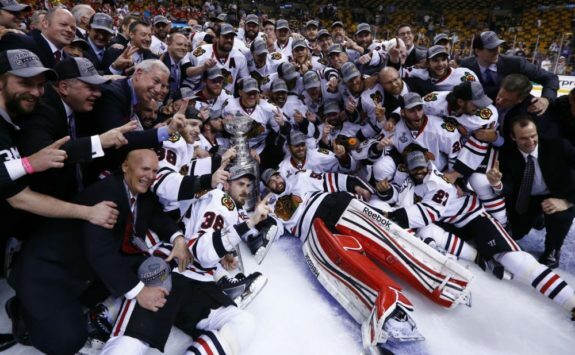 Indeed, a look back at the past few seasons reveals that these assumptions appear to hold merit – no Presidents’ Trophy winner has won the Stanley Cup since the Chicago Blackhawks did so during the lockout-shortened 2012-13 season, and no winner has gone on to claim the Cup following a full 82-game slate since the 2007-08 Detroit Red Wings. Also coming into effect when looking at previous Presidents’ Trophy winners is recency bias – the Washington Capitals were the lucky (unlucky?) winners of the Presidents’ Trophy during each of the last two seasons, but they were ousted in the second round on both occasions by the eventual champion Pittsburgh Penguins. The Caps’ long-standing struggles in the Stanley Cup playoffs and against the Pens in general, along with their status as Presidents’ Trophy winners, contributed to their failures receiving a lot of play in the media and among fans on social media. For whatever reason, Presidents’ Trophy winners just don’t seem to have the same level of success in the playoffs as they did in the regular season. Why? Well, there isn’t one single reason. Between running into a hot goaltender, faltering under the added pressure of being the Stanley Cup favorite (looking at you, Washington), peaking at the wrong time, suffering injuries to key players, or running out of gas after a long regular season, multiple factors can combine to get in the way of a team’s Stanley Cup dreams. In the case of the 2013-14 Boston Bruins, who lost in seven games to the Montreal Canadiens, a hot goaltender on the opposing team was to blame. In the regular season, when teams play one another four to five times at the most, facing a hot goaltender and losing one game isn’t a huge deal. 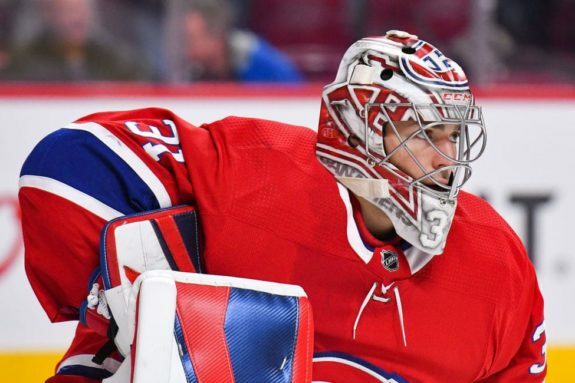 In the playoffs, though, a hot goaltender can steal a series, and that’s exactly what happened to the B’s in 2014 – Carey Price stopped all but 15 of the 234 shots he faced in the series – good for a .936 SV% – as the Habs took down their hated rivals in seven games. When it comes to the 2014-15 New York Rangers, they appeared to run out of gas. After reaching the Stanley Cup Final in 2014 (and playing 25 games in the process) the Rangers began the 2015 postseason with a five-game series victory over the Penguins. Despite the quick series, their triumph wasn’t easy – all five games were decided by one goal, and two of them went to overtime. The story was again the same in the Blueshirts’ second-round matchup against the Capitals. The Rangers fell behind Washington 3-1 in the series, but they fought back to win the final three games to advance past their Metropolitan Division rivals. Unbelievably, all seven games again were decided by one goal, meaning the Rangers had to grind out each victory during the first two rounds. All of this finally caught up to the Blueshirts against the Tampa Bay Lightning in the Eastern Conference Final. The Rangers were 5-2 at Madison Square Garden through the first two rounds, but they dropped Game 2 on home ice and were shut out 2-0 in Games 5 and 7 as they saw their season come to a premature end at the hands of Tyler Johnson, Nikita Kucherov, Steven Stamkos, and Ben Bishop. The Curse – Fact or Fiction? Despite all of their recent failures, No. 1 teams have won their fair share of Stanley Cups since the 1985-86 season, when the NHL first began awarding the Presidents’ Trophy. 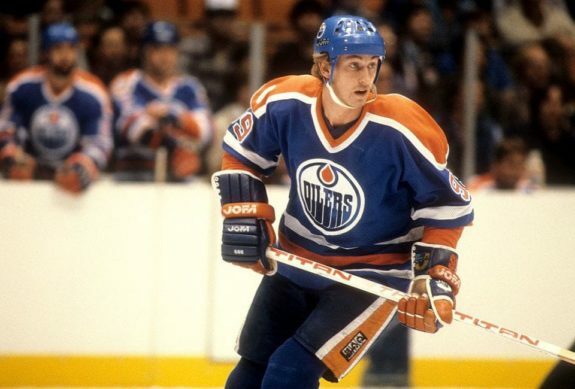 Wayne Gretzky’s Edmonton Oilers were the winners that season, but they lost to the rival Calgary Flames in the second round. Gretzky’s Oilers again took home the hardware in 1986-87 with a 50-24-6 record, and they succeeded in taking home the Stanley Cup that year as well, as they took down Ron Hextall and the Philadelphia Flyers in seven games. The Flames then had their turn with winning back-to-back Presidents’ Trophies, losing to the Oilers in the second round in 1988 before winning it all in 1989. Mark Messier’s Rangers were the next to take home both trophies in 1994, defeating the Vancouver Canucks in seven games to earn Lord Stanley’s Mug. The Detroit Red Wings then had their chance, but they lost to the underdog New Jersey Devils in the Cup Final in 1995 and were defeated by the Colorado Avalanche in the 1996 Western Conference Final despite finishing with an NHL-record 131 points in the regular season that year. Near the turn of the millennium, we saw Presidents’ Trophy winners go on a bit of a run – the Dallas Stars, Avalanche, and Red Wings took home the Cup in 1999, 2001, and 2002, respectively. Sandwiched in between the three Stanley Cup Champions were the 1999-2000 St. Louis Blues, who lost to the eighth-seeded San Jose Sharks in the first round. Since the Red Wings’ triumph in 2002, we’ve seen four Presidents’ Trophy winners bow out in the first round, compared to just two that have gone on to win the Cup. Detroit lost to Edmonton in 2006, the Sharks lost to the Anaheim Ducks in 2009, Washington lost to Montreal in 2010, and the Canucks lost to the Los Angeles Kings in 2012. As you can see, and as we discussed earlier, historic Presidents’ Trophy winners have lost in the first two rounds nearly twice as often as they’ve actually won the Stanley Cup. That may sound bad, but consider that teams finishing at No. 1 overall in the league still have won the drink 25.8% of the time over the last 31 seasons. That leaves the 15 other teams in the playoffs 74.2% combined odds of winning, which averages out to around 4.95% per team. In other words, Presidents’ Trophy winners are five times more likely to win the Stanley Cup than any of the other 15 teams participating in the playoffs. With odds like that, it’s clear that the Presidents’ Trophy curse is nothing more than a popular myth. I’m sure if you told a fan of any team in the league that their club would have a one-in-four shot of winning it all when the playoffs started, they’d take those odds in a heartbeat. At any rate, winning the Presidents’ Trophy helps a little bit, but it’s not a guarantee of any kind of postseason success. That’s what makes the Stanley Cup playoffs so much better than any other sport’s postseason – unpredictability. You could draw random teams out of a hat for your NHL Bracket Challenge entry and probably come up with better guesses than 90% of the population. So, stop worrying so much about where your team is seeded or who they’re matched up against in the first round – just sit back and enjoy the two-month-long ride to the Stanley Cup. After all, it’s the most wonderful time of the year.